In the wake of the turbulent 1960s, a new style of song and songwriter came to the fore — a style marked by vulnerable introspection and raw, naked emotion. Backed by little more than a lone acoustic guitar or simple piano, these exciting voices descended upon Los Angeles, the emerging epicenter of the American music scene, and the Troubadour, the famed West Hollywood club that nurtured this community of gifted young artists — and blossoming critical, commercial sensations. 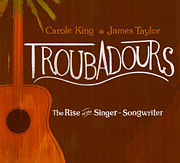 Interweaving the intriguing story of the club that cemented their musical legacy, Troubadours is a first-hand account of the genesis of the singer-songwriter movement, centering on the historic collaboration between Carole King and James Taylor, as well as on Jackson Browne, David Crosby, Joni Mitchell, Kris Kristofferson, Bonnie Raitt, the Eagles, Elton John, and many others. A post-screening panel with director Morgan Neville, photographer Henry Diltz, singer/songwriter JD Souther, drummer Russ Kunkel and bassist Leland Sklar will follow.